D immitis is found in all 50 states, with increased prevalence in warmer climates. Mosquitoes extract the L1 microfilarial stage of D immitis from an infected dog. L1-L3 molting occurs within the mosquito. The L3 larval stage enters the bloodstream of another dog when the mosquito bites. L3-L5 (adult) molting occurs within the dog. Any dog that does not receive preventive medication is at risk for heartworm disease. Adult heartworms lodge in the pulmonary artery and reproduce. The direct endothelial contact of adult worms induces an inflammatory response (ie, arteritis) that causes endothelial thickening. The degree of host immune response directly influences the extent of the disease process. Blood flow obstruction (by the presence of worms) and endothelial thickening can lead to pulmonary hypertension and fibrosis. Antigen–antibody complexes can cause microvascular and glomerular damage. Embolism of dead worm fragments and fibrin clots can lead to hypoxemia. 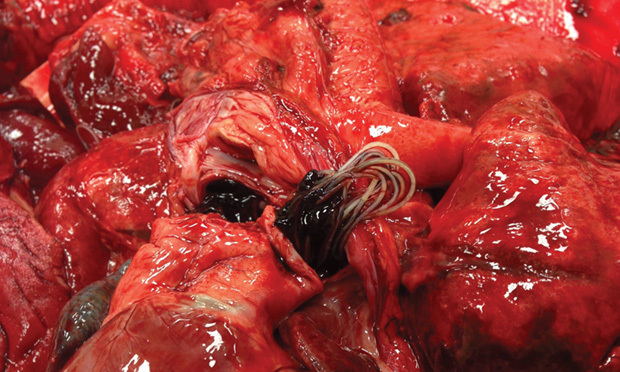 Larger worm burdens can cause caval syndrome. Worms back up into the right ventricle and atrium and become entangled in the tricuspid apparatus. Shear force of RBCs against the worms creates intravascular hemolysis, hemoglobinemia, and hemoglobinuria. Volume overload because of tricuspid and/or pulmonary insufficiency and right ventricular systolic dysfunction can lead to signs of right-sided heart failure. Volume underload of the left side of the heart can cause hypovolemia and shock. Many dogs with D immitis infection have no signs, but cough, exercise intolerance, and lethargy may be seen. Caval syndrome is the most severe form of heartworm disease. Patients may present with pale mucous membranes, pronounced right-sided heart murmur, shock, hemoglobinuria, hemoglobinemia, and jugular pulsations. Serum chemistry panel is often within reference ranges. In more severe cases, increased liver enzyme activity may be present because of hepatic congestion from right-sided heart failure. Blunted, tortuous vessels are noted most often in the caudal lung lobes. Dorsoventral projection is best for evaluation of pulmonary vasculature. In general, abnormal findings will not be noted with uncomplicated heartworm disease. Right ventricular dilation or hypertrophy and tricuspid or pulmonic valve insufficiency may be present with more severe disease. Worms may be visualized in the pulmonary arteries, but quantification of worm burden is difficult. Echocardiography results may provide good confirmation for caval syndrome. Worms can be visualized in the right atrium/right ventricle. Antibody testing is not often performed. Tests for the presence of mature adult female worms; heartworm larvae must have been present 6 months for a positive test result. The test is very sensitive and nearly 100% specific. Microfilariae testing is confirmatory, but differentiation from microfilariae of Acanthocheilonema reconditum (formerly Dipetalonema reconditum) is important. Negative results may occur if a dog receives macrocyclic lactone preventive medication. To determine severity of disease and help predict therapy response and potential posttreatment complications, pretreatment evaluation (ie, staging) should be performed. Melarsomine dihydrochloride (Immiticide, merial.com) is approved for use by the FDA. These stages are not proven to be eliminated by melarsomine dihydrochloride. Doxycycline is often difficult and/or expensive to obtain; minocycline is a common replacement. This therapy weakens adult worms and makes them less fertile. Corticosteroids are often recommended if the dog shows clinical signs (eg, coughing). Diphenhydramine can be administered before melarsomine administration. The potential exists for irreversible heart damage while waiting up to 5 years for all worms to die. Risk for thromboembolism exists until all worms have died and are absorbed. It selects for macrocyclic lactone resistance. Strict cage rest throughout the duration of treatment is crucial to prevent life-threatening pulmonary embolism caused by dead worms. Gradual return to activity can take place 6–8 weeks after final administration of melarsomine. Execute staging (examination, laboratory studies, thoracic radiography). Begin doxycycline at 10 mg/kg q12h for 3 weeks. Begin oral macrocyclic lactone once monthly. Recommend moderate rest and/or corticosteroid if signs are present. Administer diphenhydramine at 2.2 mg/kg PO or parenterally. Administer melarsomine at 2.5 mg/kg via deep lumbar epaxial injection. Administer NSAID or corticosteroids as indicated. Administer melarsomine at 2.5 mg/kg via deep lumbar epaxial injection twice 24 hours apart. Administer NSAIDs or corticosteroids as indicated. Begin gradual return to activity. On day 120, test for microfilariae, and, if positive, retest in 4 weeks. Perform antigen testing to confirm elimination of adult worms. After 1 month, 2 additional injections should be administered 24 hours apart. Adverse effects include pain at injection site, lethargy, and allergic reaction. If the patient is not receiving corticosteroids, discomfort can be alleviated with NSAIDs for several days following injection. Minocycline can be used at the same dose if doxycycline is unavailable. Preventive medications can be started at diagnosis and continued for life. All adult heartworms should be eliminated within 1–2 months of final melarsomine injection. Six months after completion of melarsomine therapy, results of antigen testing should be negative. If results are positive, adult infection is most likely still present, and adulticide therapy should be restarted. Testing may also be performed after 6 additional months to determine whether all worms have died. Prognosis is good to excellent with treatment. If untreated, prognosis is variable. Heartworm disease is preventable with administration of macrocyclic lactones (see Heartworm Prevention Options for Dogs). Prevention should be started at 8 weeks of age and continued for life. These medications also have efficacy against some internal and external parasites. Read the companion article, Feline Heartworm Infection. WENDY MANDESE, DVM, is a clinical assistant professor in the department of primary care and dentistry at University of Florida, where she also earned her DVM. Prior, she was involved for 11 years in general practices located in Orlando and Gainesville. AMARA ESTRADA, DVM, DACVIM (Cardiology), is associate professor and associate chair in the department of small animal clinical sciences at University of Florida. Dr. Estrada’s interests include electrophysiology, pacing therapy, complex arrhythmias, cardiac interventional therapy, and cardiac stem cell therapy. She has contributed to numerous research and clinical publications on emergency and critical care medicine and is associate editor of Journal of Veterinary Cardiology. Dr. Estrada earned her DVM from University of Florida before completing an internship at University of Tennessee and residency in cardiology at Cornell University. 2. A combination of doxycycline and ivermectin is adulticidal in dogs with naturally acquired heartworm disease (Dirofilaria immitis). Grandi G, Quintavalla C, Mavropoulou A, et al. Vet Parasitol 169:347-351, 2010. 3. Wolbachia and its influence on the pathology and immunology of Dirofilaria immitis infection. Kramer L, Grandi G, Leoni M, et al. Vet Parasitol 158:191-195, 2008. Dirofilaria immitis and Wolbachia pipientis: A thorough investigation of the symbiosis responsible for canine heartworm disease. McHaffie J. Parasitol Res 110(2):499-502, 2012. Heartworm and Wolbachia: Therapeutic implications. McCall JW, Genchi C, Kramer L, et al. Vet Parasitol 158:204–214, 2008. Textbook of Veterinary Internal Medicine, 7th ed. Ettinger S, Feldman J (eds)—Toronto: WB Saunders 254:1373-1380, 2010.